Dallas Cowboys defensive coordinator Monte Kiffin walks the field before an NFL football game against the Philadelphia Eagles, Sunday, Dec. 29, 2013, in Arlington, Texas. 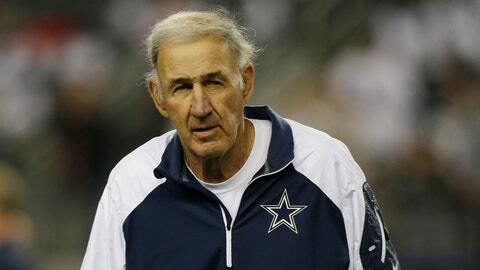 Monte Kiffin says he wants to keep coaching the Dallas Cowboys defense, but that decision might not be up to him. In the 73-year-old’s first season with the team, the Cowboys set a franchise-record, allowing 6,645 yards. Opposing teams also scored 432 points in 16 games against the Cowboys, four shy of the franchise record. Jerry Jones fired Rob Ryan last January after the Cowboys defense finished 19th in the NFL. Jones could choose to do the same after Kiffin’s 4-3 scheme led to the Cowboys ending the season last in the league. But Kiffin wants a chance to get it fixed. "I don’t plan on retiring," Kiffin said late Sunday night. "I’d like to keep on coaching. I’m proud to be a Cowboy." Jones said he would take a few things into consideration when evaluating Kiffin. "I wouldn’t evaluate Monte Kiffin without taking in consideration our circumstances this year with injuries, his ability to put in place guys coming in and out on a weekly basis," Jones said. "One thing about having the career that he’s had is you get to look at the whole career when you’re looking at it and so, no, I wouldn’t evaluate him based on this year."